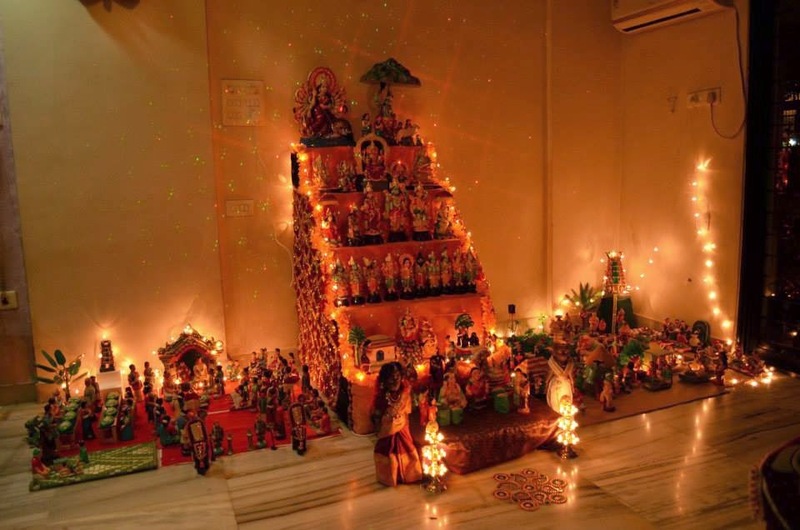 ‘Navaratri’ was just round the corner – it was time to bring the doll collection from their boxes resting on the loft. Hubby and sonny obliged me by helping out with them a day prior to the start of the festival. As I carefully unpacked each of the dolls from the old clothes-packing, each seemed to have a story to tell – the ‘Rama Pattabhishekam’ set, 'Shakti' in her various avatars, the 'marapaachi couple'…….. – all heirloom to me. Last year I was abroad during the festival to be with my two-month-old grandson. 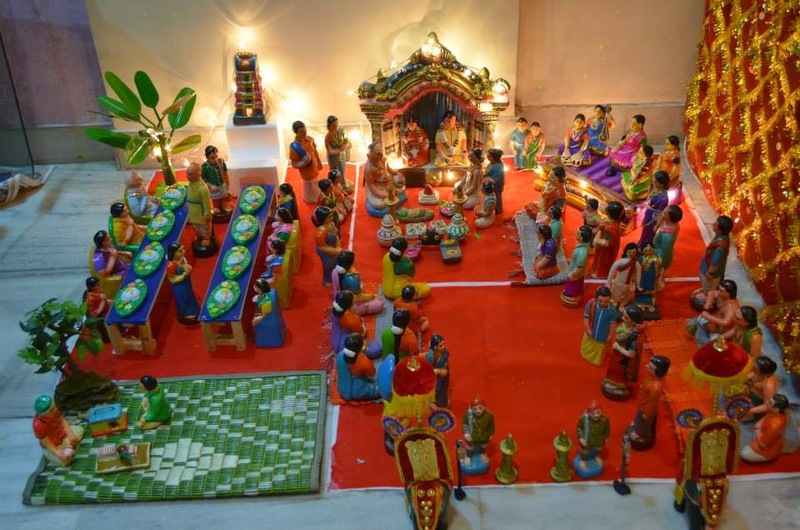 The year before last, I had set up ‘golu’ on a grand scale and invited all my friends and neighborhood ladies for ‘haldi-kumkum’. The nine days always served as an excuse for all of us to splurge our exclusive silk saris and matching accessories. This also provided an occasion for Amma to sing all her favorite ‘keertanams’ – she’d drag me to accompany her especially when she had to touch the high notes. ‘Vaasudevayani’ and ‘paraamugamela’ were our masterpieces – it’s not anything close to a statement like ‘ranga pooravi haara’’ was one of M.S’s classics – we are just home-singers – a shade better than ‘bathroom singers’, that is! The highlight of my previous ‘golu’ was my ‘Appa’s’ visit on Saraswati Puja evening. My parents were staying at a stone’s throw from my house. But Appa could not walk up the slope, so I brought him over by car to show him my ‘golu’. 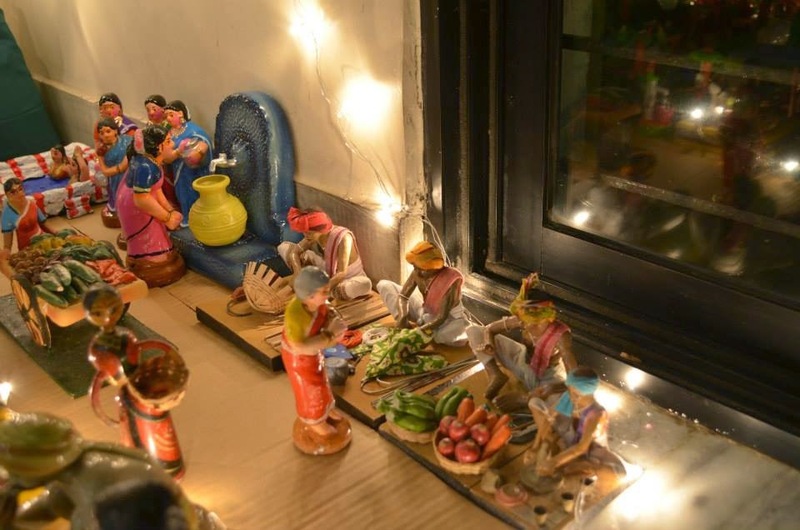 When I offered him the fancy bag with coconut, a little packaged gift and ‘chundal’ prasadam, he flaunted it with child-like excitement My Amma had also put up a small doll-show at her place. I’d help her out in preparing ‘prasadam’ every day and setting up a couple of packets for the ladies expected for the day. On ‘Dussera’, Amma’s close friends had come to her place in the evening and they had a long song session with Appa as the ardent audience. Appa was ecstatic when Amma sang ‘Jagajanani’ – he reminded her – “Remember something about this song? You had sung this when I had come to ‘see’ you.” He was referring to the ‘bride-seeing’ episode and Amma blushed a beetroot red and all had a hearty laugh. By the time the friends left it was well over nine. My parents spent another hour reminiscing about ‘those good old times’ before retiring for the night. Appa did not wake up after that; Amma was in a daze. 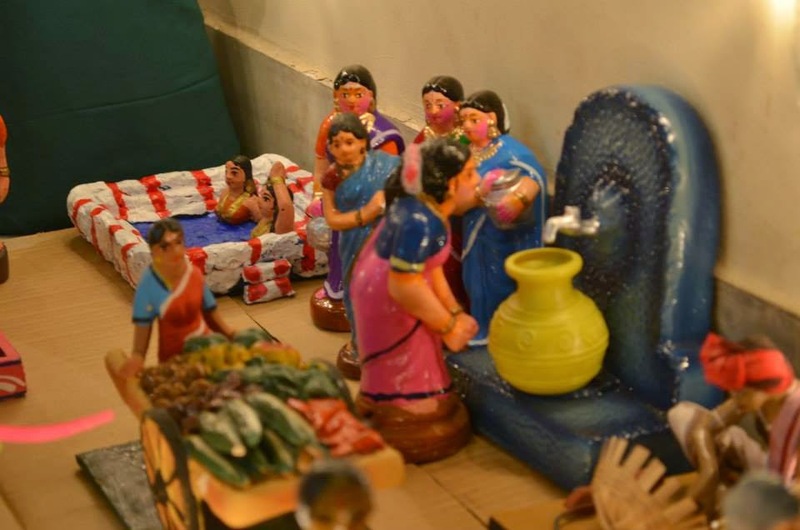 Amma’s ‘golu’ continued to linger on till the rites were over. Only after the thirteenth day could the dolls be put away. 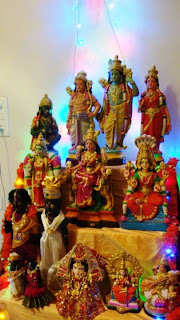 Amma handed over the best lot of her doll-sets and figurines to me – the ‘Dasavataram’set, the dancing Tanjore doll, these ‘pavai vilakku’ figurines, the fat ‘chettiar’ dolls, the cute blue crawling Krishna…… Now I held them lovingly in my hands as my eyes brimmed with uncontrollable tears. I had lost Amma just four months ago…. 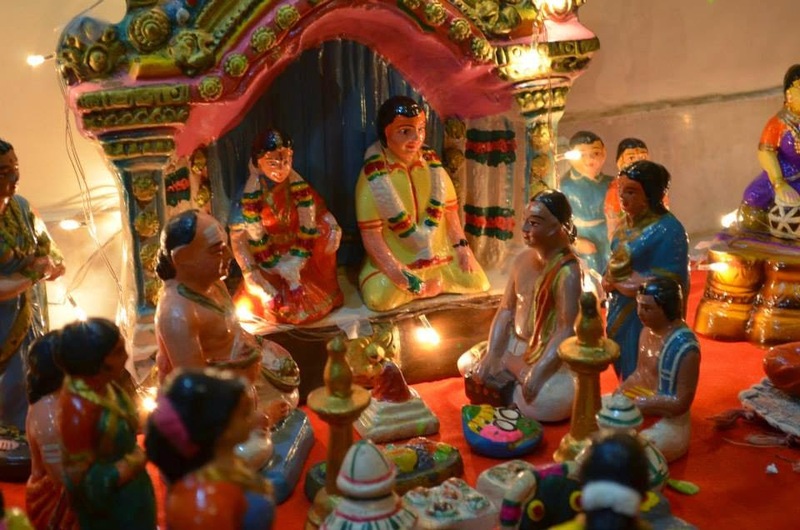 I told my maid – “Kamalbai, bring Gayatri along with you in the afternoon.” Kamalbai asked with a look of surprise – “Why Bai?” I told her that I needed her teenage daughter to help me set up the ‘golu’ as I was not able to manage single-handed – I wasn't young at 55! She wanted to say something but seemed to hesitate. “What is it Kamalbai?” I queried. She stuttered – “Bai, it’s just four months since Amma passed away. 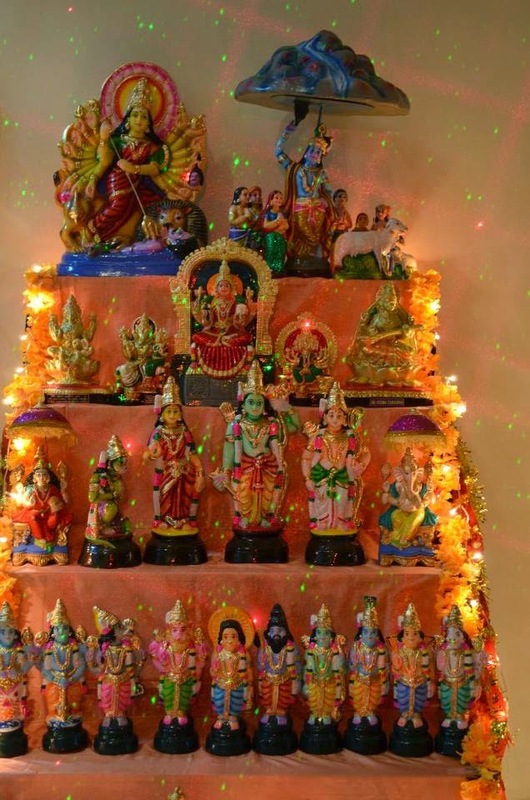 What will people say if you have a grand celebration?” I did not want to elaborate, so I just told her – “Kamal, you know how much Amma used to enjoy all the festivities and fun. This will be for her joy.” Kamalbai stood speechless. She brought along her daughter when she returned in the ath the seven tiers, which were decorated with an off-white silk dhoti of my husband with Ganga-Jamuna borders of green and red. I picked out two colorful Kanjeevaram saris for the backdrop. 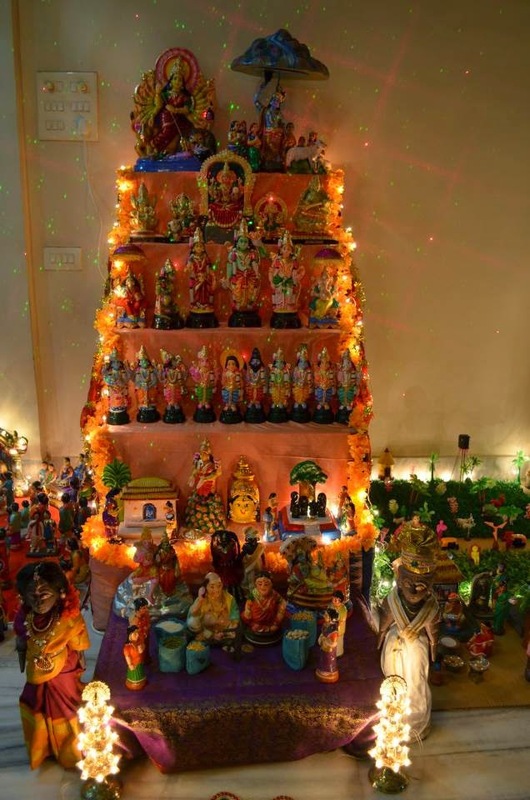 The dolls were then arranged artistically – the large impressive ones right on the top ‘tier’, and the teeny weenie ones on the lowest, each step having dolls of the same theme – ‘dasavataram’, ‘Ramayanam’, Gods and Goddesses, traditional women from various Indian states, fruits…. 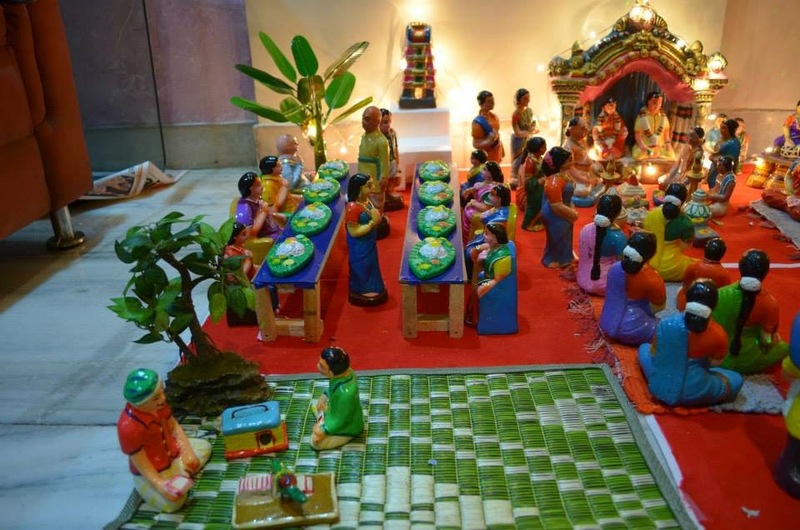 One side of the steps was exclusively devoted to a marriage-hall scene – the bridegroom and the bride standing with garlands in hands ready for the cue to garland each other as a couple of priests sat chanting inaudible mantras in front of the sacred fire. 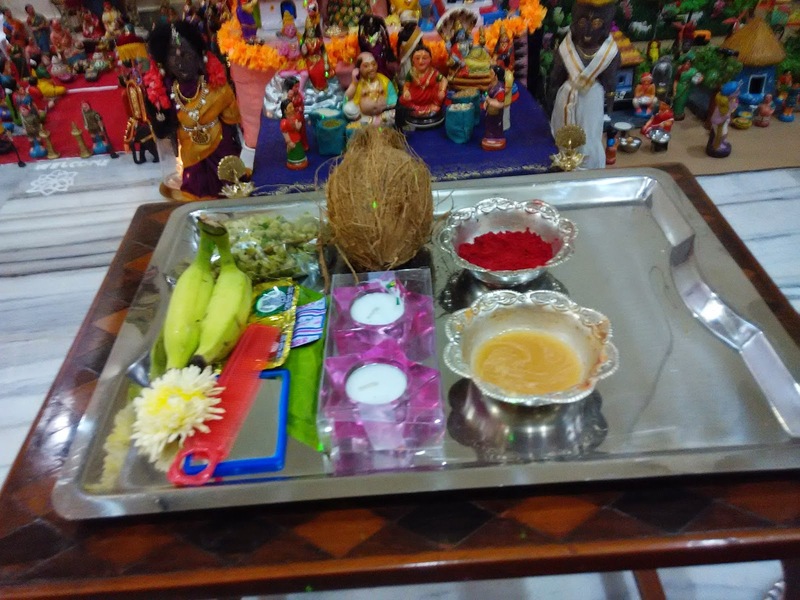 While ladies waited with trays laden with coconuts, fruits, sweets, flowers, the musicians played auspicious unheard melodies on their nadaswaram and mridangam. Men clustered around doing nothing in particular and kids squatted on chairs or floor. Marriage lunch was served on 'banana leaves' at the adjacent area. Music concert was going on at the other end! 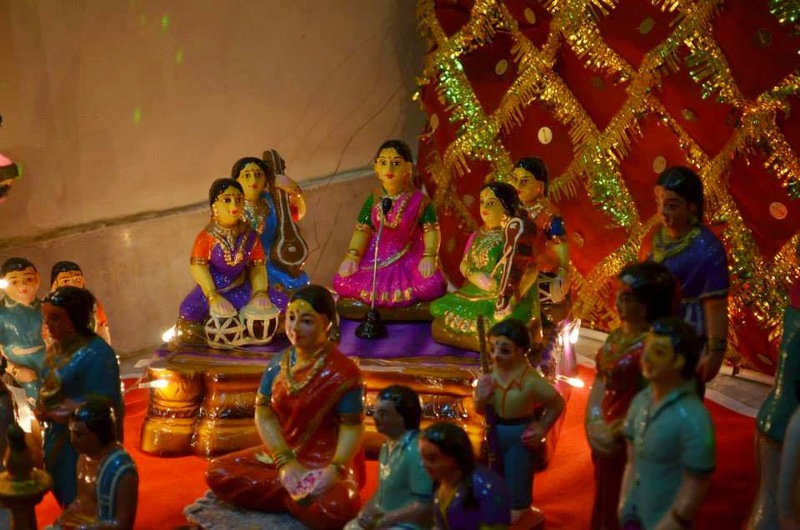 The wooden ‘marapaachi’ couple occupied center stage. Two huge silver lamps stood majestically on either side. 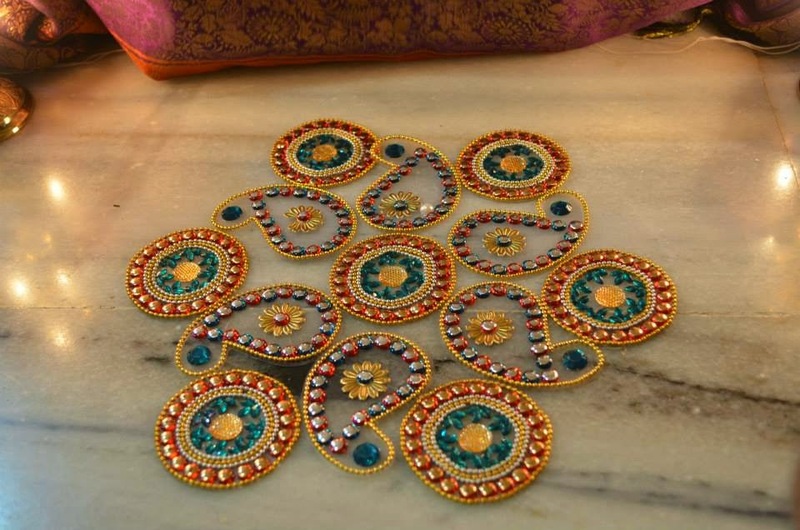 More time-consuming would be the colorful ‘rangoli’ I 'd painstakingly make in front of the ‘golu’. I would try out innovative ones too. 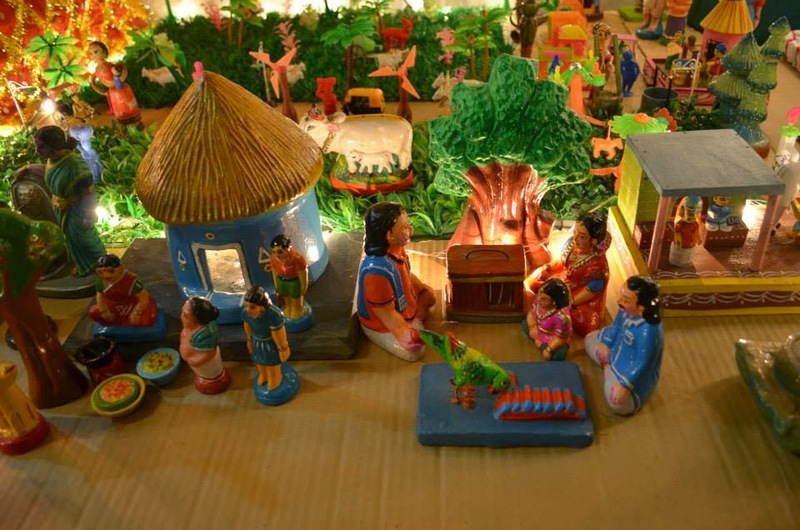 Then on one side of the ‘golu’ was the village scene – a hill at the far corner with a temple positioned on its top. There were steps marked with white powder. Tiny people were climbing up or down the hill. 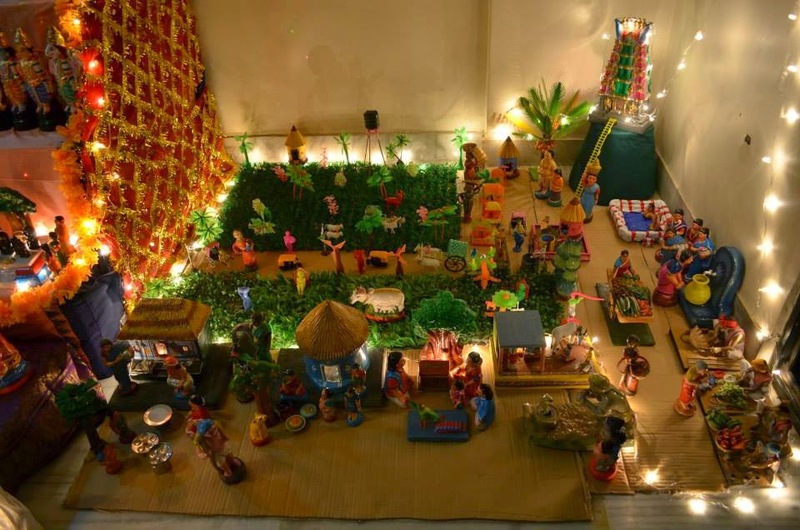 At the foothill I made a village – complete with the green fields, farmers, tractor, a well, huts, women, cattle… Now have a look at the decoration on the left side of the ‘golu’ – it was a metro scene. A huge park was created on one side with a working fountain and a neat garden adorned with colorful little plastic pieces - swing, see-saw and slide and the kids having a blast, mamas with babies in strollers, scooters parked by…. The roads saw a continuous stream of traffic – ‘Matchbox’ trucks, Porsche / Honda / Jaguar cars, raced past the mall / multiplex adorning the other side of the road…..
As for the colorful festoons and streamers and decorative little bulbs, my son took charge and did a swell job as usual. 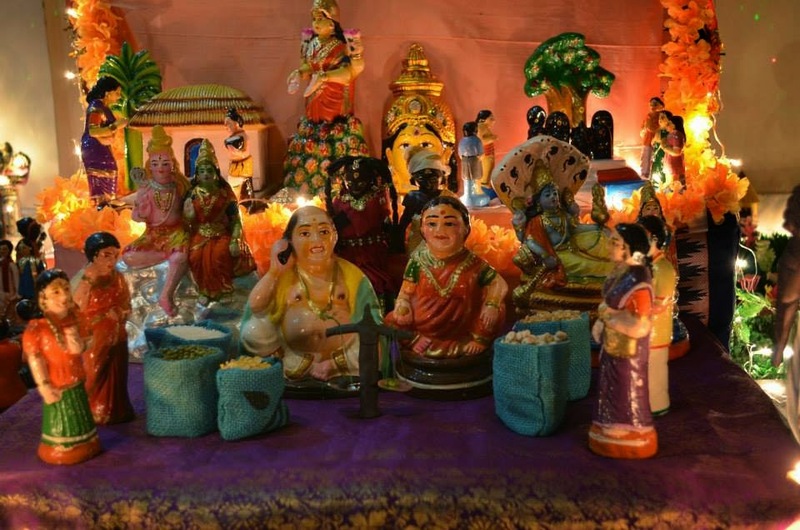 I sat all by myself and admired the final result of the day’s labor – earlier Amma used to sit with me, offer little suggestions and finally go gaga over the spectacular ‘golu’ – at that time I would just regard it a ceaseless chatter, now I was left yearning to hear a word from her. 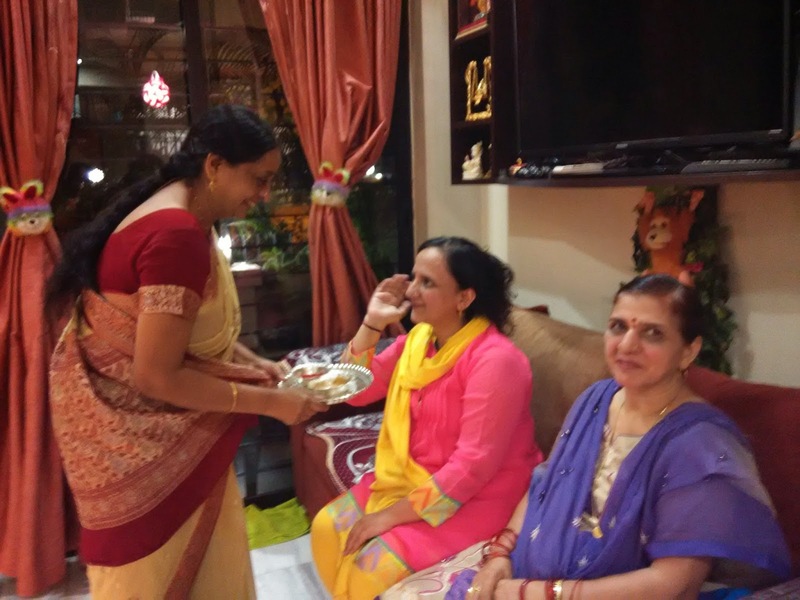 I would invite my friends over the telephone for ‘haldi-kumkum’ on different days of the navaratri period so that I would have a manageable number every evening and I could attend to them individually. But now I did not feel like inviting anyone. I experienced a vacuum on the first evening – I missed Amma – she would be the first lady I would honor with the auspicious haldi-kumkum, betel leaves, betel nut, banana, coconut, special gift of the year, a small mirror, a little comb and a packet of the prasadam of the day ( a different variety of ‘chundal’ every day). That was the practice till the year before last. Last year as I was abroad, I was saved from the upheaval of not being able to offer Amma ‘haldi-kumkum’ as Appa had passed away. This year she herself wasn't around! Somehow I felt like keeping aside her special packet beside the ‘golu’. 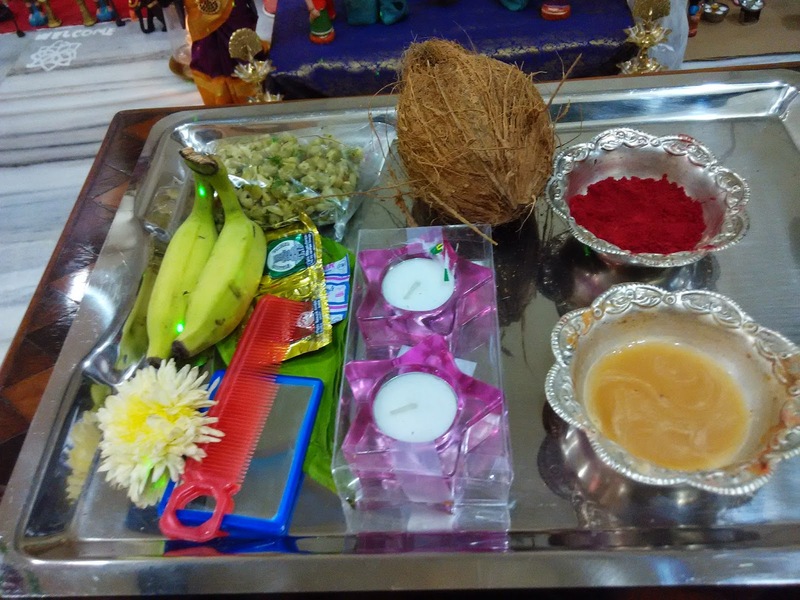 The silver tray with the silver holders for haldi, kumkum, chandan and rose water stood untouched. 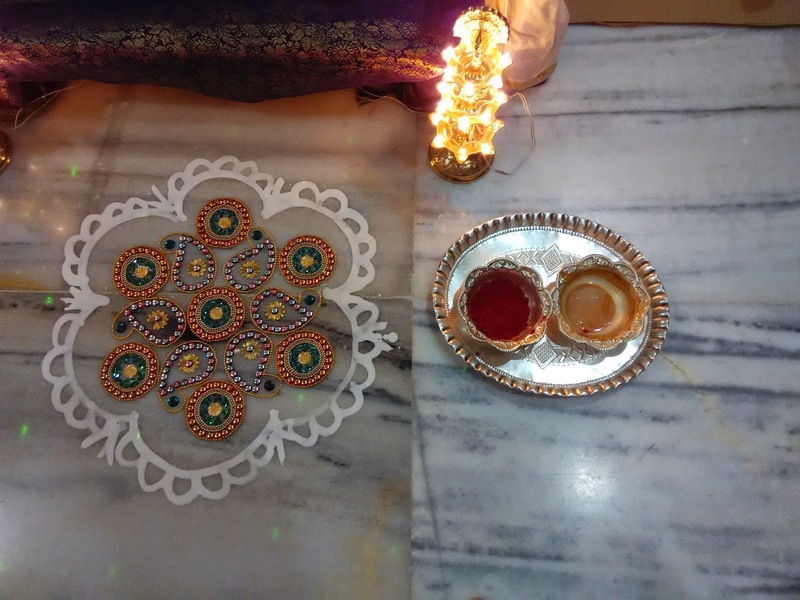 I just lingered in the room in silence throughout the evening which dragged on without the splash and rustle of colorful Kanchheevaram saris and ‘pattu pavadai’s donned by lissome ladies and little lasses of the neighborhood. I gave her a naughty wink and a wide smile in reply to her generous compliments. I woke up with a start, jumped out of bed and turned on the light. Amma was smiling at me from the large laminated photo. Next day I dialled all my friends to invite them. 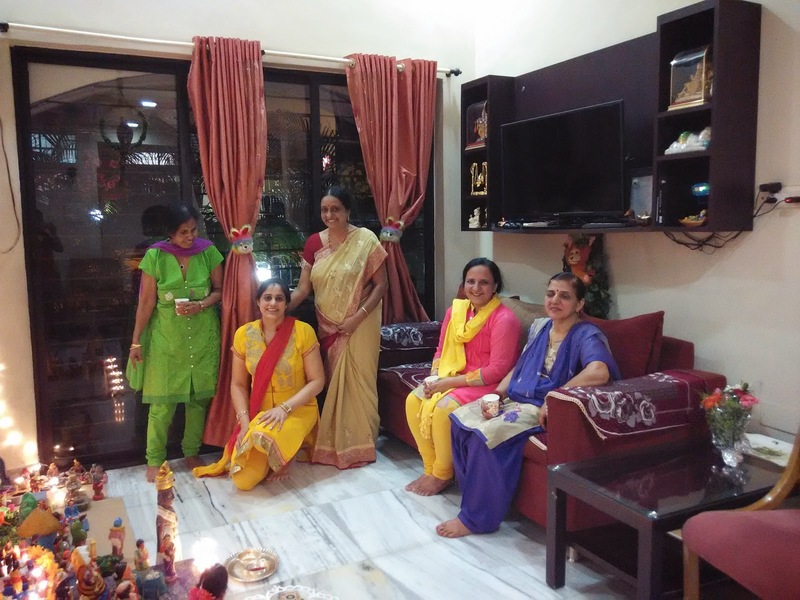 There would be strains of music, sounds of chatter at my place this ‘navaratri’ as ladies and children would gather to admire my ‘golu’ and collect their goody bags along with ‘haldi-kumkum’. For Amma’s sake! Photos - Courtesy - my sister Hema Krishnan and her family. Any resemblances to persons living or dead is coincidental. Found this story on a google search of "Navaratri Haldi-kumkum". Lovely! Thanks. You will like the fresh set of photos recently added.